A new set of wheels is usually one of the top 3 items on a "When I Win the Lottery" wishlist, and while our preferences may vary, we're usually on the lookout for something luxurious. Well.. how does this grab you? The Bugatti Veyron Diamond Ltd. - worth two million pounds!!! 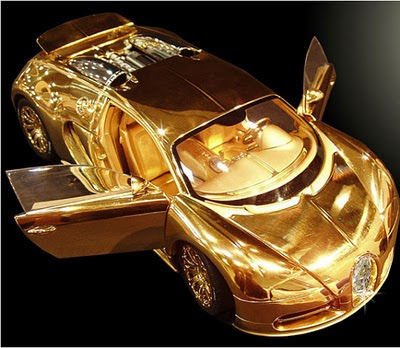 – was created by Liverpool-based designer Stuart Hughes in partnership with Swiss luxury model car maker Robert Gulpen. Weighing in at 7kg, it has been created with platinum, solid 24ct gold, and a 7.2ct single cut flawless diamond on its front grill. The 10 inch car also boats functional steering and a highly detailed engine. In a limited edition of three, owners also get a certification of authenticity, an aluminum case and photo documentation of the manufacturing process.